N. Ye. Rachkov in his works embodied the image of the Russian soul and identity of the people. His paintings are filled with deep philosophical meaning. The picture “Girl with berries” is striking in its openness. This is a stunning portrait of a little Russian girl. The girl offers to try the berries. The artist so realistically conveyed the plot, which creates a sense of reality, I want to reach out and try the forest gifts. An open childish face exudes kindness and affection, innocence and naivety are read on it. It is children who are so naive, they look at others in a different, trusting way. This is so often not enough for adults. The girl wants to treat, disinterestedly, I do not demand anything in return. Wide open eyes open the soul and it is impossible to remain indifferent. As if the girl looks into the heart and becomes ashamed of the bad deeds, and I want to do good. The hands of the child firmly hold a cup of berries. This symbolizes the value of labor, the small child is afraid of dropping the berries that were given to her by such labor. It would seem that in such a little girl and whence came so much understanding of life, the correct assessment of values. Beads on the neck of the child so decorate it. She is still small, but she likes to dress up. 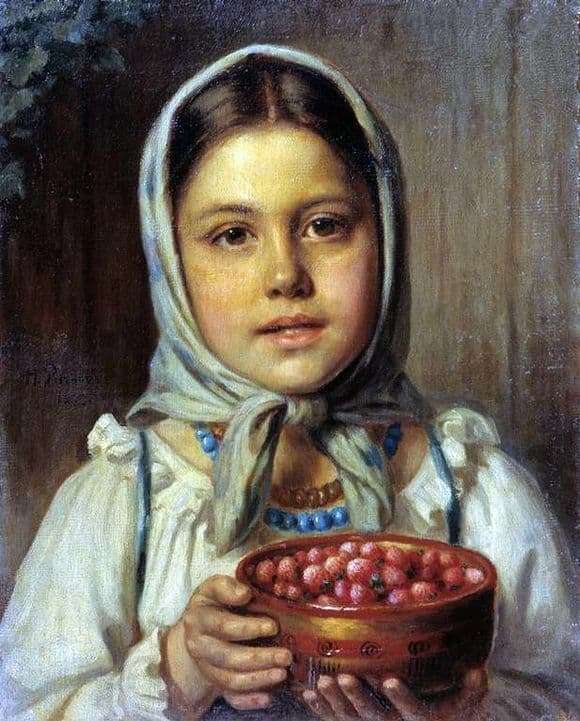 Her mouth is half-open, as if the girl is offering to taste the berries and it seems that she is speaking to you. From this piercing gaze it is impossible to hide. With his picture, the artist showed the purity, openness of the Russian soul. In the image of the girl everything is harmonious and the clothes, and look, and gestures. A pure and naive creature, a girl who wants to appear adult. At that time, children worked a lot and at a young age understood the price of labor. Such a pure image pushes people to good deeds. In the modern world, there is a lack of kindness, and, looking at the picture, you return at another time, magical and pure.